40th anniversary cardboard sleeve reissue from Led Zeppelin featuring the high quality SHM-CD format (compatible with standard CD players) and cardboard sleeve replica of the original UK LP artwork. 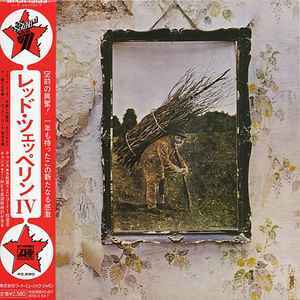 This version of "Led Zeppelin IV" uses a replica of the original E-style jacket and Red-Maroon label (not the green-orange design of the regular edition Atlantic presses of the time). Audio comes from the 1994 digital remasters. Part of a ten-album Led Zeppelin cardboard sleeve reissue series featuring the albums "Led Zeppelin," "Led Zeppelin II," "Led Zeppelin III," "Led Zeppelin IV," "Houses Of The Holy," "Physical Graffiti," "Presence ," "The Song Remains The Same," "In Through The Out Door," and "Coda." The CD also comes with a booklet in japanese with lyrics (in english/japanese) and a description of the CD format. Chinease replica of 2008 japan release, cd quality is superb, album art (cardboard sleeve) is very good.